Completely custom louvers offer you tons of functionality all while looking great. Looking over the landscape of your commercial property, you may see opportunity to enhance the professionalism and efficiency of the area. By using custom louvers, you can create a look that separates your business from those around it, and benefit from several other perks that come with installing the louvers. Check out the top five benefits of using custom louvers. Custom louvers add a specific look to every property that they surround. Depending upon your style and the aesthetic that you’re going for at your commercial property, louvers are definitely a big element that will enhance the image of your business. 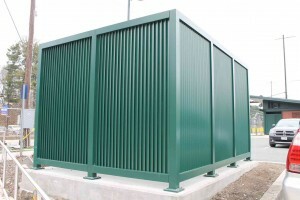 Often, louvers are even used to separate certain areas of the business. For example, buildings where only employees are authorized to enter from areas where customers are served. If your company is located in a business park where there are several other commercial properties, it can get confusing for customers and other business partners to find your location. Custom louvers help separate your property from others. All you’ll have to do is direct people toward the new, shining louvers that surround your building. Custom louvers help enhance the privacy of your business operations and clients from the general public. If your company uses designs, products, or recipes that you want out of the view of the public, added privacy is a key benefit of installing louvers on your commercial property. Whether it’s for safety reasons or just enhanced control, custom louvers are essential in limiting access to your commercial property. It will also help direct people to the correct department or building, if your property features more than one. They provide the ideal place to put signs that further direct employees or customers where they should be. Aside from privacy, the foremost reason to install custom louvers is for the security. Louvers that are rigid and well-designed alone will thwart burglary attempts by themselves as they give would-be thieves an added layer of protection that they’d need to surpass to gain access to the building. This entry was posted on Friday, January 5th, 2018	at 3:26 pm	. You can follow any responses to this entry through the RSS 2.0 feed. Both comments and pings are currently closed.